The Hall Family has been growing premium cherries for three generations and the fourth generation are eagerly involved in all facets of the business. In 2016, they decided to offer customers the unique opportunity to buy premium cherries direct from their upmarket farm gate shop. In the past cherries have been sent to Sydney and Brisbane markets where they are sold to supermarkets, boutique fruit shops or exported overseas. They want to share their passion for growing beautiful cherries and enjoy the experience with the customer first hand. Their orchard is immaculate with manicured lawn down each row and they practice the latest in biological farming to achieve the best quality. They offer the best varieties based on their firmness, flavour and size. Each cherry variety is tested by the family to pass the test and only then do they offer it to the customer. 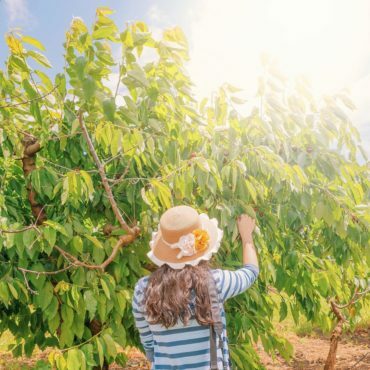 During select weekends in December each year they open their orchard up to the public for the rare opportunity to U-Pick large premium cherries. Bring a picnic blanket or sit in the beautiful garden that surrounds the modern farm gate shop to enjoy the ultimate cherry experience. Check Facebook for regular updates.